The AYA 4 was a very nice project, and it apparently remained on your radar way after the originally produced quantity was sold out. So we will make it one more time. The Audial website has been relatively open for contributions during the previous years, however we got a bit constrained with blog layout, and apparently reached the point when it is necessary to facilitate communication. The use of a signal coupling transformers requires a somewhat different approach to the system grounding. AYA 4 is another edition of famed AYA DAC, now with no-compromise 192 or 384 kHz asynchronous USB stage. Optionally, this USB front end is four channel capable. Things emerged slowly, but the outcome is another statement piece. Model S4 is TDA1541A based reference DAC, that includes S/PDIF, and sonically improved and up to 384 kHz capable, asynchronous USB input. Two major firmware options became available since USB boards were released. F/w version 3.5 enables 352.8 kHz and 384 kHz support with TDA1541A simultaneous data or PCM1704 output, while version 3.6 brings 4-channel functionality with I2S output. In that way, USB board with firmware 3.6 and two stereo DACs can be used as a two-way digital crossover. These updates are available for download for both original, and Mk2 USB interface board version. So, is it 384 kHz capable? Premium version of Model A uses Audial made, real copper binding posts. Now, these are available for separate purchase. How much does the number of bits matter? TDA1541A distortion performance shows no practical difference between its regular 16 bit, and 14 bit “mode” of operation. When it comes to the ladder (“R-2R”) DACs distortion, it looks like everything is about converter accuracy. More bits improve only on S/N ratio. Originally released in 2016, as ready made module, this high quality asynchronous USB interface featured galvanic isolation, two XO master clocks and reclocked output. It was unique for its ability to output TDA1541A simultaneous data format, but it could also output I2S / SPDIF, or PCM1704 format, supporting dual balanced DAC topologies at that as well. 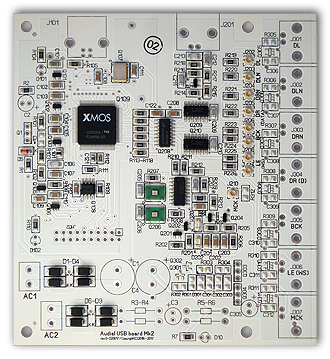 This interface was offered again in 2017, both as a module, with u.FL, and as a completed device, with BNC output connectors. Purely sonically, transformer coupled output has a more calm presentation, with a more quiet background, and somewhat more precise soundstage. On the other hand, transformers can lack some definition at the most bottom end. Actual benefits and shortcomings will also depend on the environment. Two new articles bring more details about the ultimate volume control used in the Model A. The first article describes the approach, and the second brings more information about cermet potentiometers. Even though it was discontinued in 2009, the interest in this great DAC never actually disappeared, so it had several after-runs. “DS” was its 2015 release. Officially operating for more than decade now, Audial became well established among the audio devotees, and recognized for its unique products qualities. We shipped the products to more than 40 countries so far. Subscribe to not miss important news and announcements.